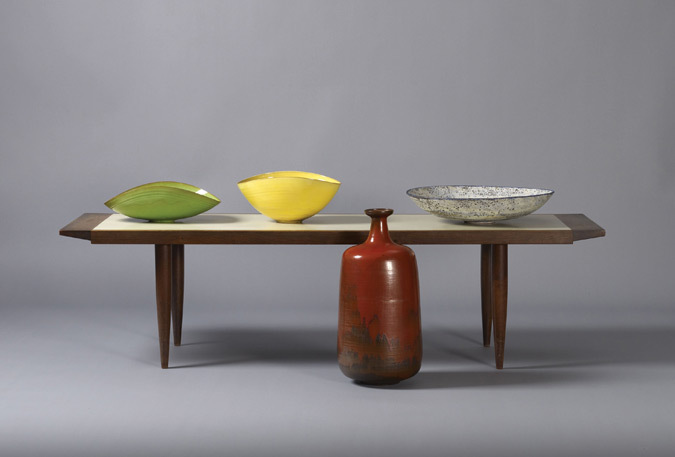 The exhibit explores over 100 works of renowned midcentury furniture craftsman, Sam Maloof (1916–2009) and his circle of friends, who gathered at the Maloof residence and workshop—which have become a central part of the dynamic Pomona Valley art community—to share a meal and their common interest of hand-crafted objects. The exhibit showcases some of the earliest Maloof pieces, such as a round, plywood coffee table with walnut legs, decorative arts and crafts such as ceramic works by Otto and Gertrude Natzler (above), an office chair made for the prominent industrial designer Henry Dreyfuss, three iterations of his classic rocking chair, a table lamp by William Manker, among other objects. Visitors will also find two rare watercolors produced early in Maloof’s career. The exhibit is part of Pacific Standard Time: Art in L.A. 1945–1980, a Getty collaboration spanning six months, bringing together over 60 cultural institutions all across Southern California.